The H Harness offers a lighter alternative to the bulldog. Snaps give this style a modern feel, and works well on a wide variety of bodies. The H Harness is an alternative to the bulldog. Snaps give this style a lighter, more modern feel, and works well on a wide variety of bodies. 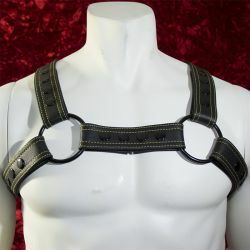 It holds your upper chest and shoulders tightly as it frames you for dancing and other fun activities.